Ten major Japanese F&B groups in Singapore have set aside their rivalry and come together to help raise at least S$250,000 for the March Japanese earthquake and tsunami relief efforts. (click picture for bigger version). 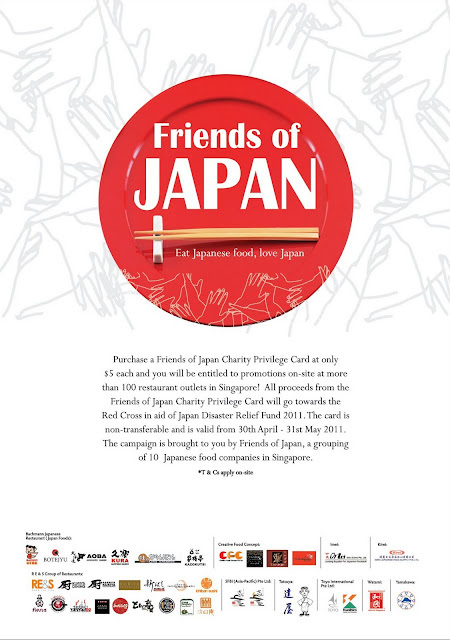 They have launched a "Friends of Japan" privilege card (S$5) that will give 10% discounts and promotions for the month of May 2011. All proceeds will go to the Singapore Red Cross in aid of the Tsunami Disaster Relief 2011. The collaboration involves over 35 brands and 100 restaurants across Singapore. They also applauded the Agri-food and Veterinary Authority (AVA)'s work in making sure all food imports from Japan are safe for consumption.